The physical properties of food lipids such as polymorphism, crystal structure, structure of self assembly systems, structural variations during kinetic process, melting point, enthalpy of fusion, etc., have been studied because these affect the texture of foods such as chocolate, margarine, cream and so on. In situ crystallization and transformation kinetics of polymorphic forms of saturated-unsaturated-unsaturated triacylglyceroles: 1-palmitoyl-2,3-dioleoyl glycerol,1-stearoyl-2,3-dioleoyl glycerol, and 1-palmitoyl-2-oleoyl-3-linoleoyl glycerol Food Research International, 2016, 85, 244-258. Lipid crystallization kinetics – role of external factors influencing functionality of end products Current Opinion in Food Science, 2015, 4, 32–38. Triacylglycerol Crystal Growth: Templating Effects of Partial Glycerols Studied with Synchrotron Radiation Microbeam X-ray Diffraction Crystal Growth & Design, 2014, 14, 5219-5226. 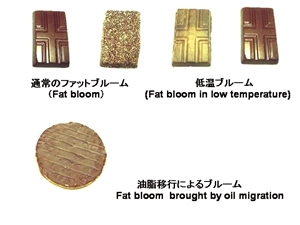 Visualization of oil migration in chocolate using scanning electron microscopy–energy dispersive X-ray spectroscopy, Food Structure 8 (2016) 8–15. Structural elements responsible for the glucosidic linkage-selectivity of a glycoside hydrolase family 13 exo-glucosidase, FEBS LETTERS, 589, 7, 865, 869, MAR 24 2015 Saburi W, Rachi-Otsuka H, Hondoh H, Okuyama M, Mori H, Kimura A.